Rent a big projection screen for the perfect outdoor movie, Movie Night, Dive in Movie or Movies in the park. Our 20' wide 16' tall sealed air inflatable movie screen with no blower noise. Our Outdoor movie theater comes complete with a 4000 Lumen wide screen projector, 1500 watt JBL sound system, Sony Blu Ray player / DVD Player. Add a wireless microphone to your movie night for only $49.95 with a 300 foot range. If you want to feel the movie upgrade to our 2600 watt JBL sound system for an additional $100.00. No movie is complete without a popcorn machine or old fashion popcorn cart . The projector and sound system require power so if your movie is at a park or area without electricity we rent super quiet generators. Want to pick up all the kids and adults in the neighborhood before the movie, then rent our trackless train that will carry up to 26 kids at once and since its fully electric and super quiet it can be operating during the movie. Or you could zip line into the movie. R.M. Hillingshead of Camden, New Jersey is the man who birthed the idea of a set-up that allowed people to watch outdoor movies from their cars, and brought the concept to fruition with the first drive-in movie theater opening in New Jersey on June 6, 1933. The idea apparently didn't really catch on until the late 1940’s though and the popularity of these outdoor movie theaters seemed to peak around the 50's and 60's. There aren't as many Colorado outdoor movie theaters around as there used to be, but they are still out there. 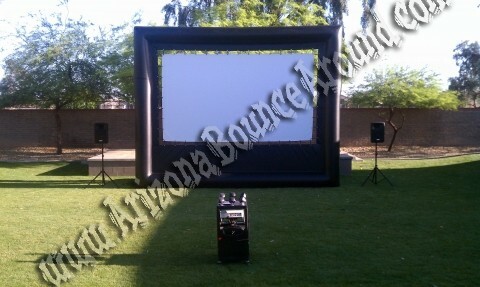 Today outdoor movies can be delivered right to your location with the invention of the inflatable outdoor move screen. These outdoor movie screens can be rented in various sizes for public or private viewing. Gravity Play Events is your inflatable outdoor movie screen rental super store and can rent you all the necessary things needed for the perfect outdoor movie. We have Blu-Ray players. High output sound systems and a sealed air outdoor movie screen with no blower noise. Our outdoor movie screen rentals can even hook up to your I-Pad, I-phone, I-pod, Laptop, or almost any video player available. We have all the hookups available for almost any devise so please call for details if you cant find it. All of our outdoor movies come complete with staff to set up and operate your movie and we can also provide music to play before the movie starts and a wired or wireless mic to use before, during or after your outdoor movie.